Here we go again. The winds of change. I was at the game last night, saw you in the warm ups and when it was announced that you were a late scratch, you could feel something was brewing behind the scenes. Thank-you, hardly seems enough for what you gave this team and this city for 10+ years, but I’m going to try. First things first, please know that you never once for a second ever let me down. Fans from across the league never really knew just how lucky Vancouver Canucks fans were to have you as a part of the team. The road wasn’t any easy one, but you have stayed the path. From one of a few players drafted from Denmark, to developing your game to the AHL and then to the NHL. From a rookie looking to make his mark to a seasoned veteran and leader, you did it all and you did it with incredible grace. In 565 games over the last 10 years in Vancouver, you have embodied everything that it meant to have the heart of a Canuck. On and off the ice you found your place in Vancouver and forever left your mark. At the beginning no one was sure of what kind of impact you could or would go on to have in an NHL lineup. You brought speed, determination and compete every single shift, every single game. No one knew what to expect but your versatility to play anywhere in the lineup and in any situation quickly won you over with the coaches, your teammates and the fans. And the rest as they say, is history. He was right, they were wrong, and you continued to prove all your critics wrong every single day. And the critics came after you a lot over the years but you never let the negativity in. You rose above it all, every step of the way. You always did whatever was asked of you by the coaches or management. You were and are the consummate professional on and off of the ice. And when called upon to be a pillar in the community and be a part of helping make a difference for the community or helping to raise awareness about the importance of mental health, you were there. You gave everything you had with every shift on the ice and every moment you gave to the community in your tenure with the Vancouver Canucks. And yes that magical run in 2011 will forever be cemented in part of your tenure in Vancouver, as will so many more on ice moments. Seeing you get your first goal, or you getting the Canucks first 3-on-3 OT goal or earlier this season when we witnessed your 100th NHL goal but for me, my all-time favourite moment happened just last season. It was an honour to meet you and talk all things hockey for a few moments. It meant more than you will ever know, thank-you. Thank-you, thank-you, thank-you and thank-you again for more than 10 incredible years of memories on and off of the ice and, the ever persistent pursuit of your dreams, and inspiring so many more to keep pursuing their dreams. I wish you all the best in San Jose, but remember, that you will always be the Canucks, honey badger. You made your coaches proud. You made your teammates proud. You made this city and Canucks fans around the globe proud. And to THIS fan, you will always and forever be a Canuck. Thank-you doesn’t seem quite enough but it’s what I have to offer. Thank-you for everything, Jannik. 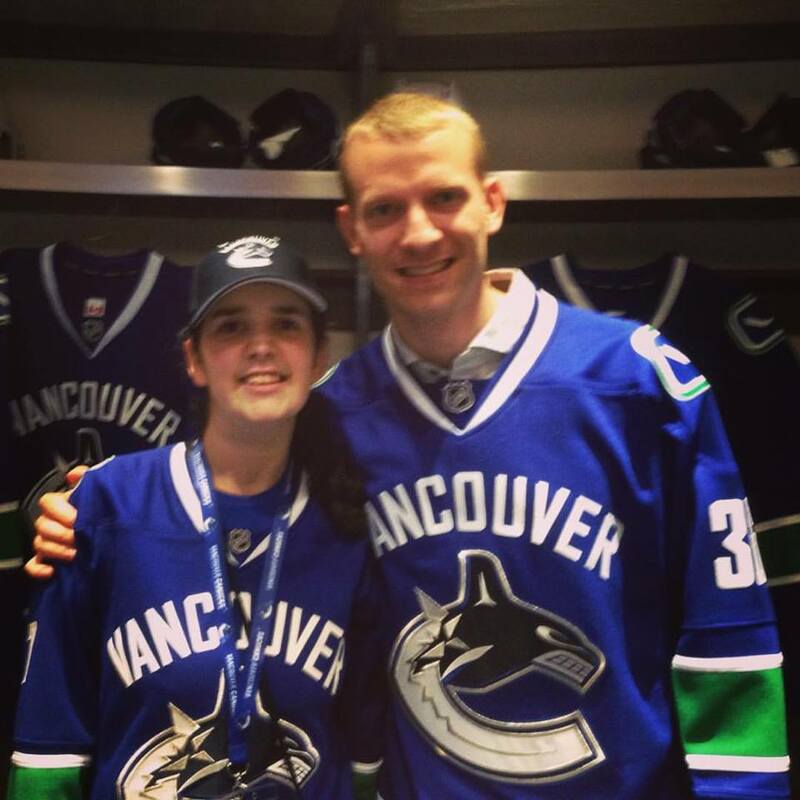 This entry was posted in Vancouver Canucks and tagged Jannik Hansen, NHL, trade deadline, Vancouver Canucks by sarahlaug. Bookmark the permalink.